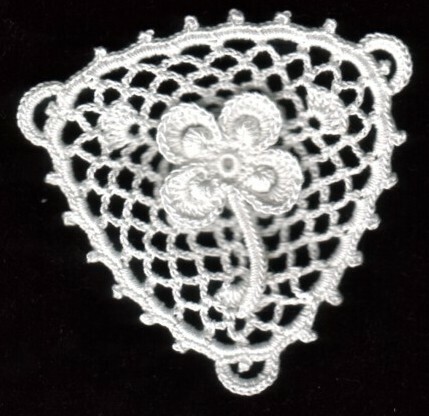 Two years ago I contacted Maire Treanor, of Clones Ireland, seeking assistance with the techniques of Irish crochet lace. 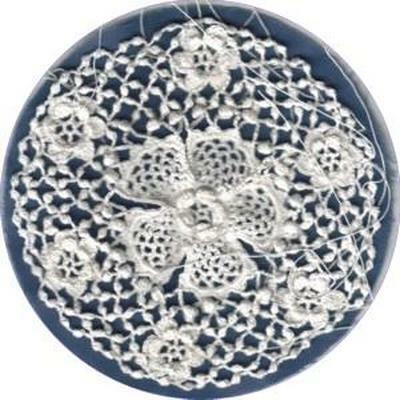 I knew of Maire's then recently published book 'Clones Lace: The Story and Patterns of an Irish Crochet' and had read an article in Piecework magazine about the history of Irish Clones Lace and the infamous Clones knot. 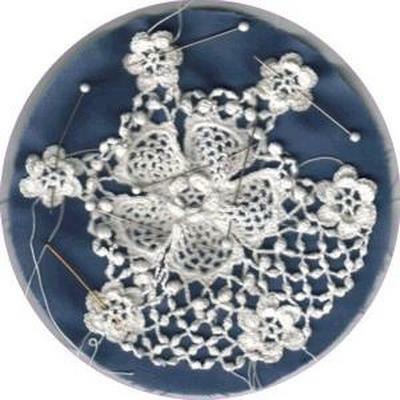 I have become a fan of this stitch and try to use it in each of my designs. 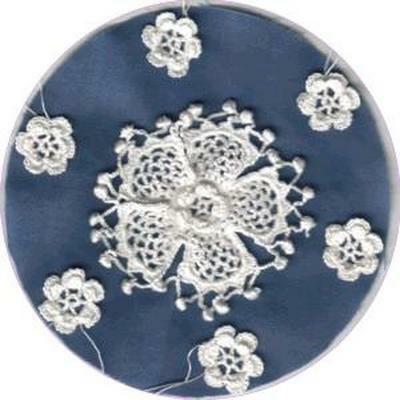 My first Clones lace project was a coaster from Maire's book. I used Long Clones knots for the background work instead of the 'authentic' Clones knot. I found it easier and quicker to make. 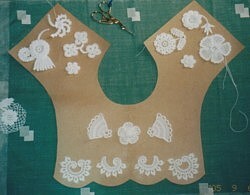 The motifs are crocheted and then basted on either brown paper, lined curtain fabric, or calico. The background is worked next. I worked in rounds until the roses are joined. Then I worked between each set of roses, repeating the pattern until the background is filled. The filling is complete and ready for the edging. 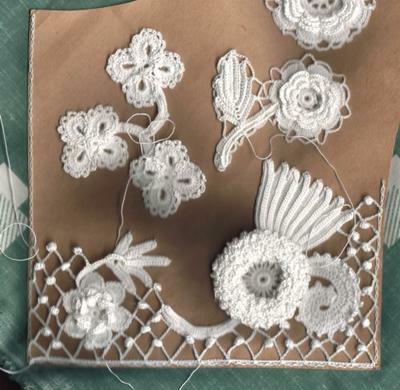 I chose a different edging than what was suggested in Maire's book. This edging was simply too hard to resist! My second attempt was a child's collar (6 yrs). This took me 1½ years to complete since I worked on it occasionally. However, over the past few months I worked earnestly until it was completed on Dec. 3rd, 2005. 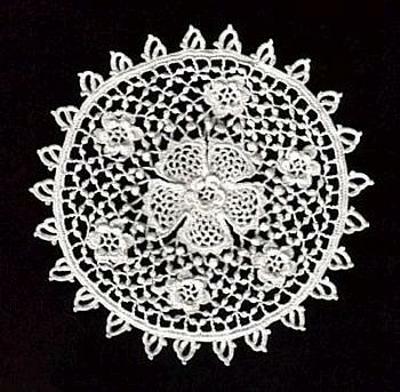 Our lace guild was having its anniversary and members were asked to bring their first and last pieces of lace made since we joined the guild. Needless to say I was determined to finish the collar. This collar went through many changes. 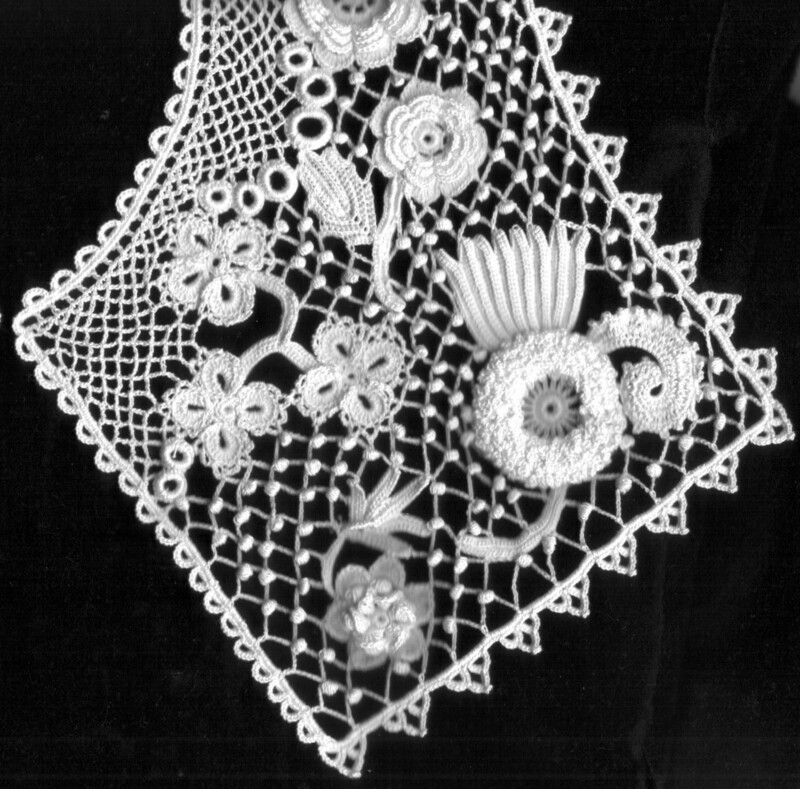 I originally prepared it for presentation as part of my speech given to an embroidery guild about Irish crochet. After the speech, I put it away as a WIP. It became a 'I will pick it up again someday' projects stuck in a drawer. It lingered in the back of my mind until the guild made its request. I wanted it to be the last project that I completed for the year of 2005. This was my first arrangement, which I was not satisfied with, but it was a start! This was the final arrangement for the left back. 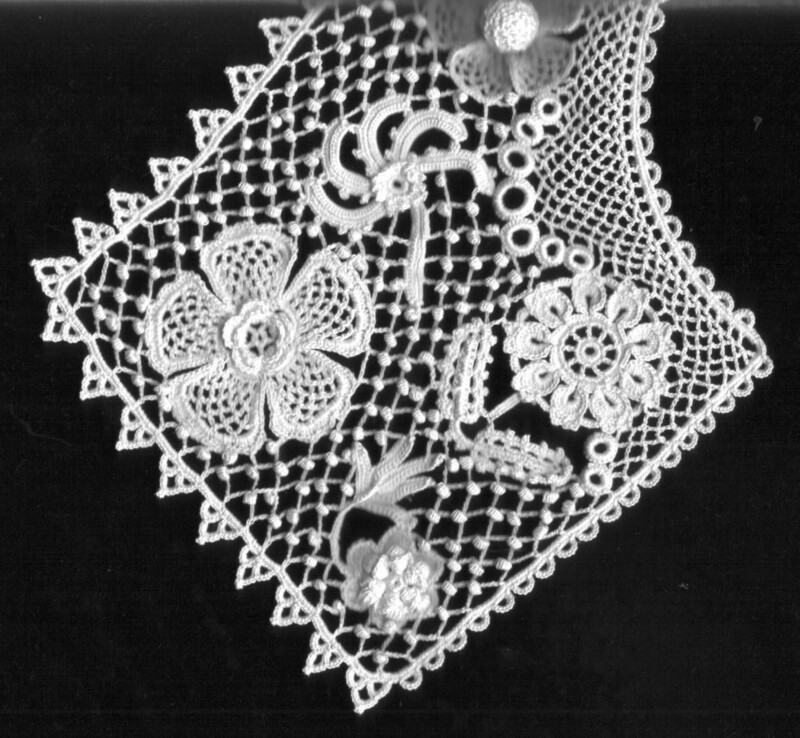 The wild rose (bottom left) and daisy (top left) is from Maire's book 'Clones Lace: The Story and Patterns of an Irish Crochet'. 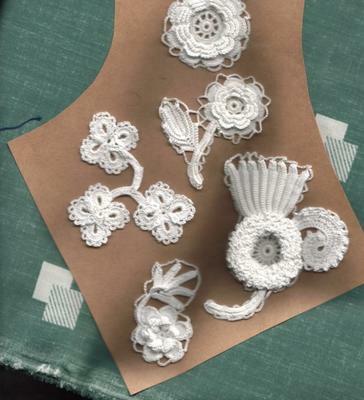 The nine loop flower (top right) is from 'Irish Crochet Lace' by Eithne D'Arcy. 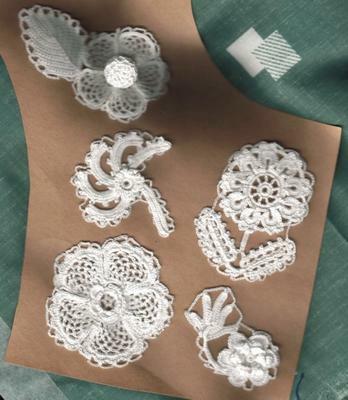 The bottom left flower is my own design while the leaves are also from 'Masterpieces of Irish Crochet Lace'. This is the final arrangement of the right back. 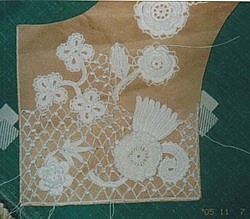 The rose (top) and clover spray (top left) is an adaptation of D'Arcy's Dahlia in from 'Irish Crochet Lace'. 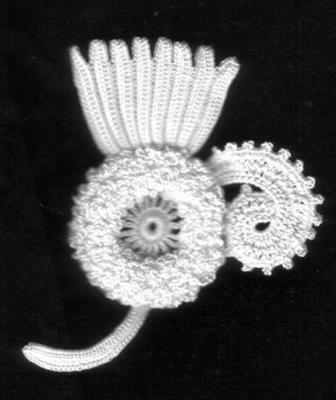 The center rose is a typical rish crochet rose and the thistle (bottom right) is from 'Irish Crochet Technique and Projects' by The Priscilla Publishing Co. This was my first attempt at the background. I chose to make an open Clones knot. Maire suggested that, though the background was nicely worked, perhaps a less dense background would be suitable. This is my second attempt. Naturally Maire was right! This is a proper Clones knot...perfect for bringing out the beauty of the motifs! If you look closely, you'll notice that I basted the pattern onto the fabric with a chain stitch at the edges. This was very helpful with the background filling. This is the continuation of the background filling. I originally worked a row of chains around each motif before basting them on the pattern hoping that the joining process would be easier...I was wrong. I had to pull out all the chain work around each one. 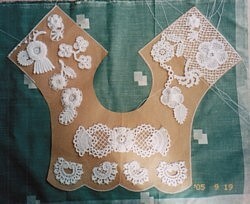 Maire suggests to work Clones knots around each motif. I'm certain she is right and I will do that the next time! I have another picture of the collar with only the edging remaining to be worked, but that picture is on another roll of film. It will be added to this page when it is developed. 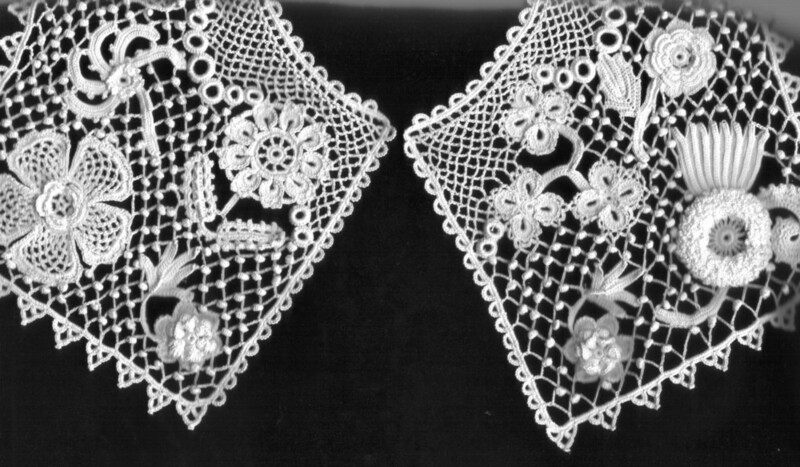 The following are scans of the finished collar: front, back and close-ups of both sides of the back.